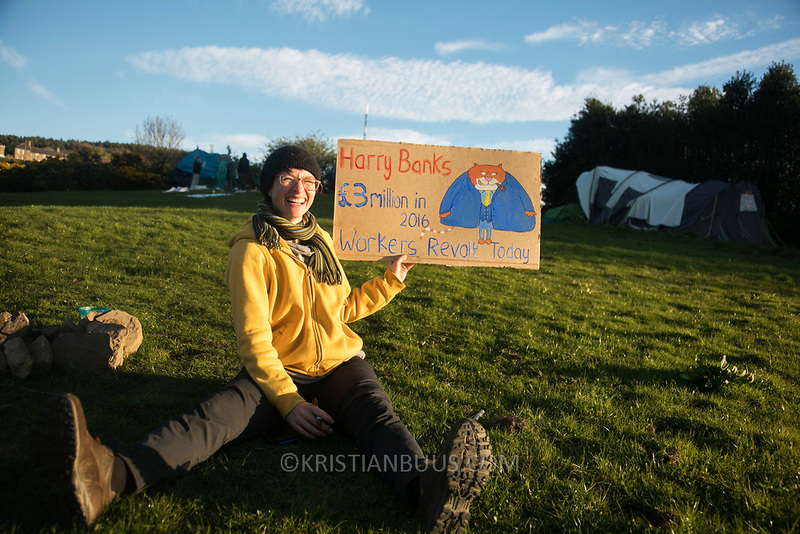 Banner and placard making in the protector camp ahead of the the day of protest against the mining company Banks outside Dipton in Pont Valley, County Durham, 4 May 2018. Sunset in Pont Valley ahead of the the day of protest against the mining company Banks outside Dipton in Pont Valley, County Durham, 4 May 2018. Locals have fought the open cast coal mine for thirty years and three times the local council rejected planning permissions but central government has overruled that decision and the company Banks was granted the license and rights to extract coal in early 2018. Locals have teamed up with climate campaigners and together they try to prevent the mining from going ahead. The mining will have huge implications on the local environment and further coal extraction runs agains the Paris climate agreement. A rare species of crested newt live on the land planned for mining and protectors are trying to stop the mine to save the newt.